I don’t lile this word but she looks so chic I can’t describe it diffrently. this woman looks fantastic! Anyone know the maker of her coat, shoes, purse? I love the pattern of the coat, the colored shoes with the metal heels, and the clutch, so … I love everything in her outfit! Nice photo! Love the massive houndstooth knit! That is so nice pic and I like her coat and burgundy boots,. Bordeaux-bleu, one of my favourite colour combinations..
she looks so chic, love the coat, clutch and boots. 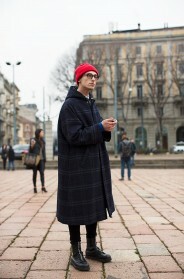 Love the amazing coat and how it goes with the shoes! Color harmony couple! They balance well. His coat looks a little ill-fitted from this angle. She is perfect. In love with this shot! I don’t even like the coat that much (although her shoes and bag are to die for), but I love her smart yet slightly coquettish expression as though she and Scott are having a private moment while the gentleman beside her has no idea. Lovely! Her boots ….oh! So nice. And his turtleneck compliments her colors too. I am in love with this coat. Must have it!!! It’s Giorgia Tordini, Scott and Garance photograph her often. I guess her coat is from her own collection, REVE. Great coat, boots and overall look; She and her dude matchy matchy!!!!! Its wardrobe love. That’s a really nice coat! Love coat and boots, sometimes there is still someone who matching clothes.. Coat, shoes (!!!) and the girl herself are so classy! This is sooo hot. She looks great, with the big houndstooth, and the wonderful heels to match. Why do some women always look so put together? How can no one be mentioning her greatest accessory – the man!!! Love the coordinating color of his shirt!!! She looks great- not overly thought out, just natural style.